Gastroesophageal reflux occurs when contents in the stomach flow back into the esophagus because the valve between the stomach and the esophagus, known as the lower esophageal sphincter, does not close properly. 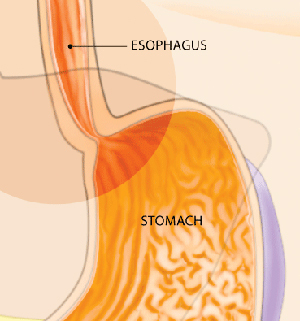 Gastroesophageal reflux occurs when contents in the stomach flow back into the esophagus. This happens when the valve between the stomach and the esophagus, known as the lower esophageal sphincter, does not close properly. What are the symptoms of Gastroesophageal Reflux Disease? Common symptoms of gastroesophageal reflux disease are heartburn and/or acid regurgitation. Heartburn is a burning sensation felt behind the breast bone that occurs when stomach contents irritate the normal lining of the esophagus. Acid regurgitation is the sensation of stomach fluid coming up through the chest which may reach the mouth. Less common symptoms that may also be associated with gastroesophageal reflux include unexplained chest pain, wheezing, sore throat and cough, among others. 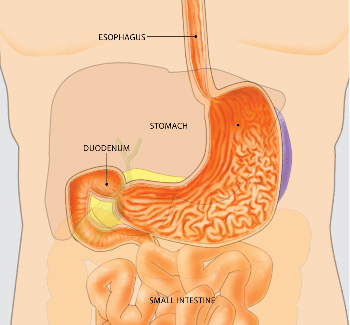 What causes Gastroesophageal Reflux Disease? Gastroesophageal reflux disease (GERD) occurs when there is an imbalance between the normal defense mechanisms of the esophagus and offensive factors such as acid and other digestive juices and enzymes in the stomach. Often, the barrier between the stomach and the esophagus is impaired by weakening of the muscle (lower esophageal sphincter) or the presence of a hiatal hernia, where part of the stomach is displaced into the chest. Hiatal hernias, however, are common and not all people with a hiatal hernia have reflux. A major cause of reflux is obesity whereby increased pressure in the abdomen overcomes the barrier between the stomach and the esophagus. 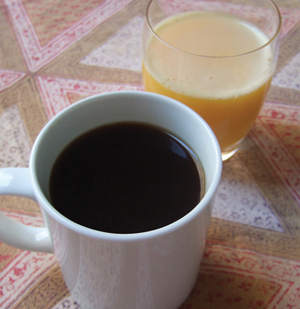 Obesity, pregnancy, smoking, excess alcohol use and consumption of a variety of foods such as coffee, citrus drinks, tomato-based products, chocolate, peppermint and fatty foods may also contribute to reflux symptoms. 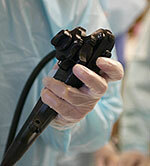 An endoscope is a medical device used by expert physicians to look inside the digestive tract. An upper endoscopy allows the physician to examine the lining of the upper part of the gastrointestinal (GI) tract, which includes the esophagus, stomach and duodenum (first portion of the small intestine). The expert physician controls the movement of the flexible tube using the endoscope handle. How is Gastroesophageal Reflux Disease diagnosed? When a patient experiences common symptoms of gastroesophageal reflux disease, namely heartburn and/or acid regurgitation, additional tests prior to starting treatment are typically unnecessary. If symptoms do not respond to treatment, or if other symptoms such as weight loss, trouble swallowing or internal bleeding are present, additional testing may be necessary. Upper endoscopy is a test in which a small tube with a light at the end is used to examine the esophagus, stomach and duodenum (the first portion of the small intestine). Before this test, you will receive medications to help you relax and lessen any discomfort you may feel. An upper endoscopy allows your doctor to see the lining of the esophagus and detect any evidence of damage due to GERD. A biopsy of tissue may be done using an instrument similar to tweezers. Obtaining a biopsy does not cause pain or discomfort. Another test, known as pH testing, measures acid in the esophagus and can be done by either attaching a small sensor into the esophagus at the time of endoscopy or by placing a thin, flexible probe into the esophagus that will stay there for 24 hours while acid content is being measured. This information is transmitted to a small recorder that you wear on your belt. X-ray testing has no role in the initial evaluation of individuals with symptoms of reflux disease. How is Gastroesophageal Reflux Disease treated? In an upper endoscopy, the physician passes a thin, flexible tube called an endoscope through your mouth and into the esophagus, stomach and duodenum. Propping up the head of the bed at night may be helpful. Should symptoms persist, over-the-counter antacids may decrease discomfort. Antacids, however, only work for a short time and for this reason, they have a limited role in treating reflux disease. Histamine H2 receptor antagonists (such as cimetidine, ranitidine, nizatidine, and famotidine) decrease acid production in the stomach. These medications work well for treating mild reflux symptoms and are quite safe, with few side effects. They are available over the counter at a reduced dose, or at a higher dose when given by prescription by your doctor. Proton pump inhibitors (such as omeprazole, lansoprazole, dexlansoprazole, pantoprazole, esomeprazole, and rabeprazole) are all highly effective in treating reflux symptoms. These medications act by blocking the final step of acid production in the stomach and are typically taken once or twice daily prior to meals. For reflux symptoms that occur frequently, proton pump inhibitors are the most effective medical treatment. These medications typically work well, are safe and have few side effects. There may possibly be an increased risk of certain side effects with high doses or with long-term use (over one year), however. You should discuss this with your doctor if you require long-term use or high doses. Prokinetics, or medications that stimulate muscle activity in the stomach and esophagus, are sometimes provided for the treatment of reflux disease. The only available drug in the market is metoclopramide, which has little benefit in the treatment of reflux disease and has some side effects, some of which can be serious. Surgery should be considered in patients with well-documented reflux disease who cannot tolerate medications or continue to have regurgitation as a primary symptom. If symptoms persist despite medical treatment, a comprehensive evaluation should be completed prior to considering surgery. The surgery for treating reflux disease is known as fundoplication. In this procedure, a hiatal hernia, if present, is eliminated and part of the stomach is wrapped around the lower end of the esophagus to strengthen the barrier between the esophagus and the stomach. The operation is typically done via a laparoscope, an instrument that avoids a full incision of the stomach. Due to the complexity of this surgery, it is important to seek a skilled surgeon who has experience in performing this procedure and can discuss the risks and benefits of the procedure. You should see your doctor immediately if you have symptoms such as unexplained weight loss, trouble swallowing or internal bleeding in addition to heartburn and/or acid regurgitation. Symptoms that persist after you have made simple lifestyle changes also warrant a visit to your doctor. In addition, if you use over-the-counter medications regularly to reduce symptoms such as heartburn or acid regurgitation, you should consult a physician to determine the best course of treatment for you.